Andrés Iniesta Luján is a professional Spanish football player who plays for the Spain National team and the popular Spanish club FC Barcelona as a central midfielder. He joined FC Barcelona's youth soccer academy at the age of 12 and he debuted for the first team in 2002. In the Nike Premier Cup of 1999, in the last minute of final he scored the winning goal and lead Barcelona Under-15 team to victory. He played alongside with a star player Ronaldhino on FC Barcelona from 2003 to 2008. His first goal for Spain was on 7 February 2007, during a friendly match against England. Andrés dated Anna Ortiz since 2008. On 3 April 2011, she gave birth to their daughter Valeria and then the couple married on 8 July 2012. On 7th march 2014, Andres and his wife lost their second child due to miscarriage. Spain won three successive major international tournaments and made history as a first team with its Euro 2012 victory, and Andrés was named Player of the Tournament. He won the UEFA Best Player in Europe and Euro Player of the Tournament Awards in 2012. 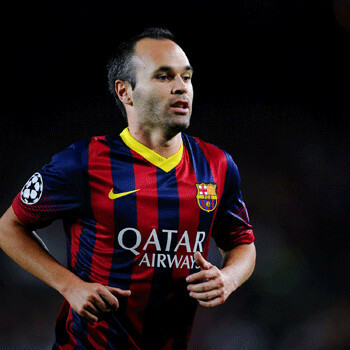 Nowadays, there is a huge rumor of Andrés getting transferred to Manchester United in January. 30 year old professional basket player from America. She plays as a forwarder in the Los Angeles Sparks of the WNBA and also UMMC Ekaterinburg of Russia. John Uzoma Ekwugha Amaechi is famous basketball player from England. After his retirement from NBA, he worked as an educator and broadcaster.